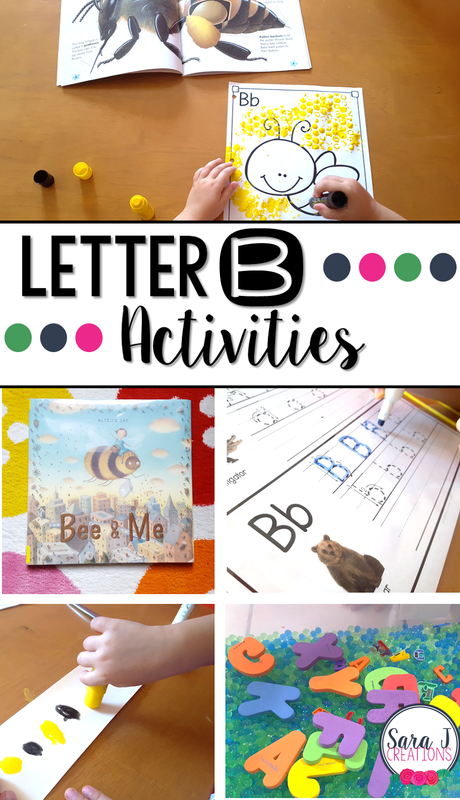 Preview: Letter B Activities that would be perfect for preschool or kindergarten. Sensory, art, literacy and alphabet practice all rolled into Letter B fun. After all the fun we had with our Letter A Activities, my daughter was excited to jump into Letter B Activities. We did some of the same activities we did with letter A, just to help get her into a routine. This also means that some of these activities can be done independently by her now that she knows how to use the supplies. So when mommy is trying to make lunch, she can practice handwriting without help from me. We also had fun with our art project and the sensory bin is always a hit! To start our study of the letter B and a week of fun activities, we read the book Bee & Me by Alison Jay. This is a wordless picture book. They can be kind of tricky at first because we don't always know how to "read" them as adults. I start by showing her the page and asking her what is happening. We continue doing this on each page. The pictures really speak for themselves and help to tell the story. We talked about how the words bee and bumblebee start with B. We also got hooked on the book Brown Bear, Brown Bear What Do You See? this week. Both of my girls love this book because they can "read" it on their own with the help of picture clues and repeating phrases. We also came up with a list of other bear books that have B's in the title. Check out the list of bear picture books here. For the B page in our alphabet book, we decided to paint with bubble wrap because it starts with a B. It made the perfect beehive for the background. Then I gave my daughter our yellow and black Kwik Stix (our absolute favorite way to paint) and we found a book with a great picture of a bee. She used the picture to help paint the black and yellow stripes. To practice writing the letter B, I put our alphabet tracing sheets in a reusable plastic sleeve and gave her a dry erase marker. Because she is still young and I'm not expecting perfection, we didn't spend a ton of time on correct form. I showed her how to form the letter, let her trace it a few times and then try writing it on her own. Then we did the same thing for the lowercase b. She loves this step now and can work on these independently. After making our bee alphabet page, we started talking about how bees go in a pattern - black, yellow, black, yellow. I grabbed a sentence strip, flipped it over and using the bee colors, we practiced AB patterns real quick. This was totally impromptu but a great way to bring math into our ABC learning. For our sensory bin we did blue beads (water beads) because it starts with B. Water beads are crazy fun! They start out super tiny and then you put them in the bin with some water and wait a few hours and they start to grow to the size of a marble. They are designed as vase filler so they are moist but they aren't wet. For the most part these are low mess - unless your little one starts flinging them out of the bin and then they get stepped on and squished. I threw in some foam letters and some magnetic letters. I let her dig around and try to find all of the A's and all of the B's.